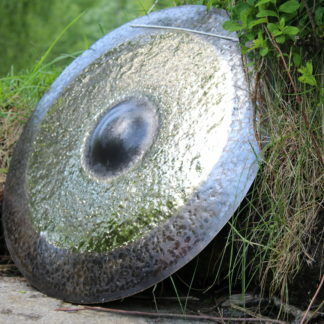 Norse gongs is a concept made by a Norwegian Gongmaster Tor Arne Håve. It is an idea to bring forward ancient forces from the time where the runes (Norsemen Script language) where used. Runes was at that time also look on to with deep respect and the people held them to be magical symbols. Symbols that could express the will of gods. The runes was used in ceremonies to create changes in the world as the outer cosmos and in the inner cosmos, in the man himself. The runes where not only used as single letters forming words, but the where also put together as a kind of mandala. A circular 8 limbed symbol with staffs coming out from the center. These running symbols is known as staff-runes. And are believed to hold particular strong power. For the first to Norse Gongs , Tor Arne Håve chose to use two quit well know staff-runs. 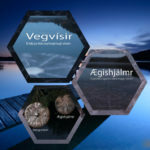 Vegvisr and Aegishjálmr are their names. 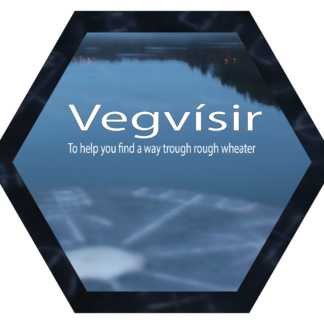 Where Vegvisr is also called the Viking Compass, it is truly a Vegvisr-Gong. A gong to guide you into your center and from that point let this center let you stay in center in bad weather or in unknown lands. 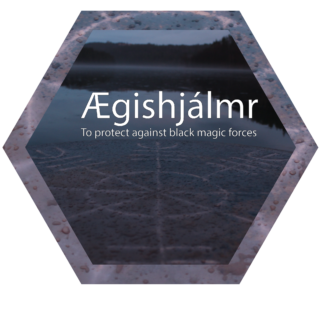 Aegishjálmr is a gong for protection against dark manipulating forces, and at that time it was seen and used as a protection for a specific form of black magic called Seidr. A kind of magic force used to confuse the mind of others. The Vikings used this symbol under their helms as a protection. The Aegishjálmr-Gong is to help you have a clear mind and keep focused in difficult and unsecure environments. In the old Norse culture, people were occupied to talk with nature, and the spirits of nature. In the myth of Death Baldrs (Balder’s death) we find Frigg’s wife to Odin who demands a oat from all kinds of elements like fire, water, metal, stone and all living beings to protect Baldr. We have made a ceremony that includes bringing power from the fire and the water and from all heavenly directions. We make this ceremony for all our gongs, and it is our baptism of the boy and the creation of the Norse Gong.